Bad was gone when I came back. His distressed sister, Boujee, who was left behind to meow by the floor-level window he’d clearly fallen out of. Guilt flooded into my stomach. Neither Bad nor Boujee are outdoor cats. Loyal Wagazine readers may remember that my ex and I had made attempts to leash-train them, but brief trips around the front yard are as far into the wild as they ever got. The idea of Bad out on his own, innocently approaching threats … I felt sick, alone, irresponsible. Every roadkill I’d ever passed floated up from memory. I rushed into the backyard and beat every bush. I yelled, whispered, and repeated his names and aliases until I was as annoyed by them as I assumed my neighbors were. I called my parents for advice and got my father as reinforcement for the hunt. The two of us set out bowls of wet and dry food, plus a few home comforts, to entice him back by smell. Then we commenced pursuit. The night’s creeping search discovered three cats, one deer and a possum, but not Bad. I fell asleep in the early morning hours next to an open screen door, Boujee snuggled right with me, eyes into the night. It thundered, hailed and poured through daybreak. Bouj and I woke to (potentially) distressing news from my mother. She’d found a grey kitten in her yard that morning and half-worried it was an ill omen. Bad, too, is grey. I wasn’t going to let the universe swap cats on me that easily (neither was my father, who, I was surprised to find out, had slept over). We emerged into daybreak with half-full water bottles, the makers of noise most likely to attract Bad. I spent my next few hours wandering aimlessly, dangerously close to private property lines. I took a break and made signs, then taped them to telephone poles. With each lap around the block, I met more and more of my neighbors. By the time the sun was setting, just about everyone knew Bad was on the loose, but no one had seen as much as a trace of him. Two friends came by around sundown to help. Midway through our pre-hunt cocktails and chatter, I heard him. It was faint, but there was no mistake. Bad had returned. He was rolling around on the grass outside the same window he’d escaped from nearly 24 hours-to-the-minute ago, unharmed and unabashed. I hugged him up and into our house. My friends toasted. My father teared up. Boujee relaxed. My relief turned to happiness. Bad was purring and all was well. 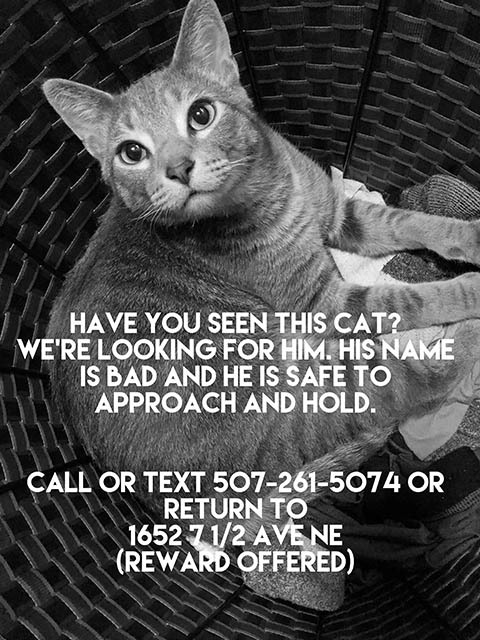 As it turns out, my worn t-shirt, Bad’s litter box, and his favorite blanket that I’d left on the porch as smell-markers likely did more to bring the cat back than my wanderings. Domestic felines have a keen sense of territory, and, unless somehow inhibited, will return home on their own accord. They also sleep 15 or more hours a day, so while I was out meeting neighbors I’d never met and yelling, “Bad,” at every shady spot I saw, he was probably sound asleep (either well-fed from his first kill in the wild or resting his nerves after the hailstorm). Daylight is a good time to put up signs and get the word out. Half an hour after his return, Bad sauntered back from the litter box and into the living room. With a hop, was perched back on the windowsill, followed by his sister. Addendum: My parents adopted the lone grey kitten that appeared the morning after Bad’s disappearance. She’s named Dali and is currently brokering peace with the two chihuahuas she now lives with. Bryan Lund is a cat-father, skier, and writer in Rochester. He double checks all exits before leaving the house now. Get a used litter box and an unlaundered shirt and bring them outside. Cats usually smell their ways home, and this is a way to amplify that ability. Cats sleep for a significant portion of their day. They’re more or less nocturnal animals. If your cat is outside, chances are he’s napping until it gets dark out. Thus, my daytime excursions were more for my benefit than anything else. Go out looking, but don’t despair when it doesn’t bring results. Make signs, almost immediately. The more people on the lookout, the more likely someone can give you news on their whereabouts. 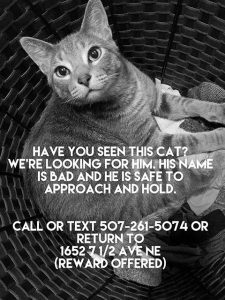 News of a missing cat spreading will also makes your random presence in people’s lawns a bit less surprising.